I'm trying to figure out a way to run a wire from the passenger footwell (where a backup camera wire is coming in) to the stereo area (where I've removed the panel and factory stereo). Does anyone have any ideas how to fish a wire though? You mean like pulling up the carpet and running it under the carpet, insulation and foam? While you are down there, check to see if there is much moisture from any sunroof/ windshield leaks. Pull up the door jamb trim, first up, then back to get to the carpet, the plastic with the Saturn logo on it. Thanks for the reply! I should have given more info. I'm actually looking to get a wire from one end of the red arrow to the other. 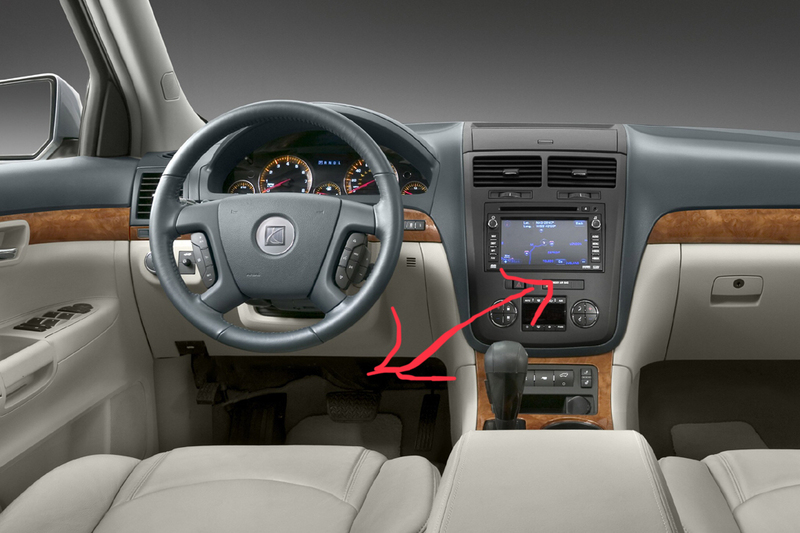 Basically, from the footwell to where the stereo is. I can get the footwell trim piece off as well as the stereo cover, but cant figure out a way to fish a wire through. Ah I figured it out. Not sure if this was smart but I basically just started poking a wire through the hole in the footwell on the right and finally got it to pop up behind the stereo.